2 Luke 5:17-26 “On one of those days, as he was teaching, Pharisees and teachers of the law were sitting there, who had come from every village of Galilee and Judea and from Jerusalem. And the power of the Lord was with him to heal. 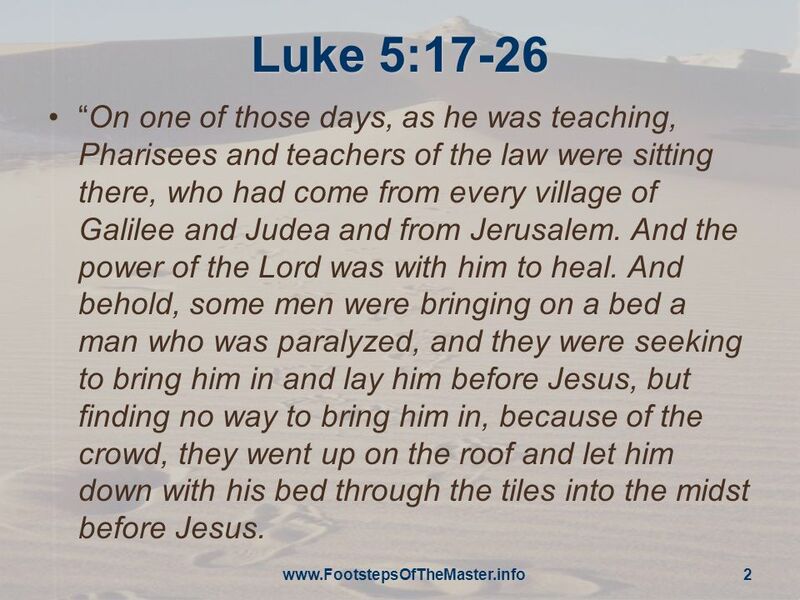 And behold, some men were bringing on a bed a man who was paralyzed, and they were seeking to bring him in and lay him before Jesus, but finding no way to bring him in, because of the crowd, they went up on the roof and let him down with his bed through the tiles into the midst before Jesus. 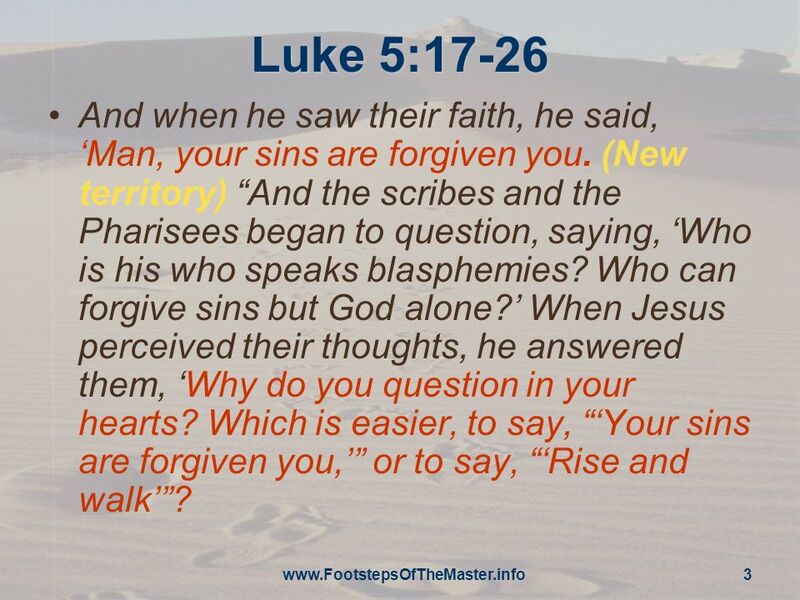 3 Luke 5:17-26 And when he saw their faith, he said, ‘Man, your sins are forgiven you. (New territory) “And the scribes and the Pharisees began to question, saying, ‘Who is his who speaks blasphemies? 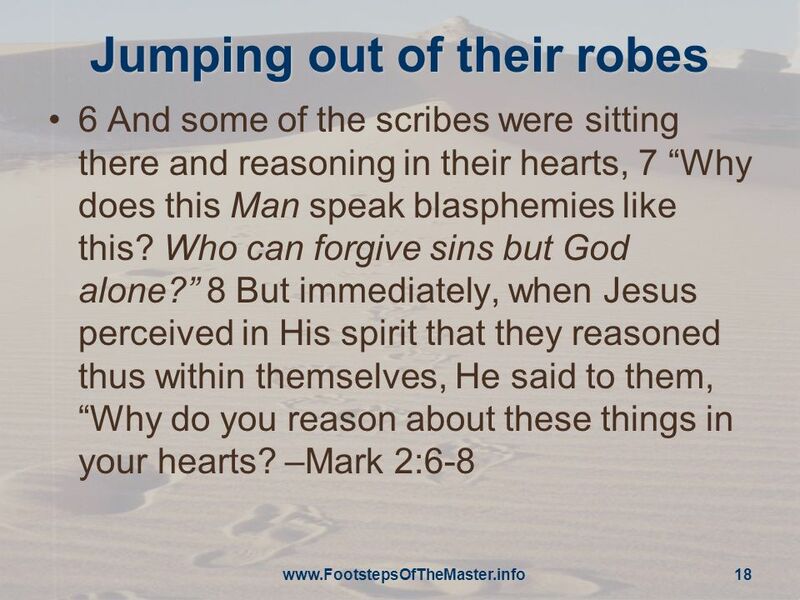 Who can forgive sins but God alone?’ When Jesus perceived their thoughts, he answered them, ‘Why do you question in your hearts? 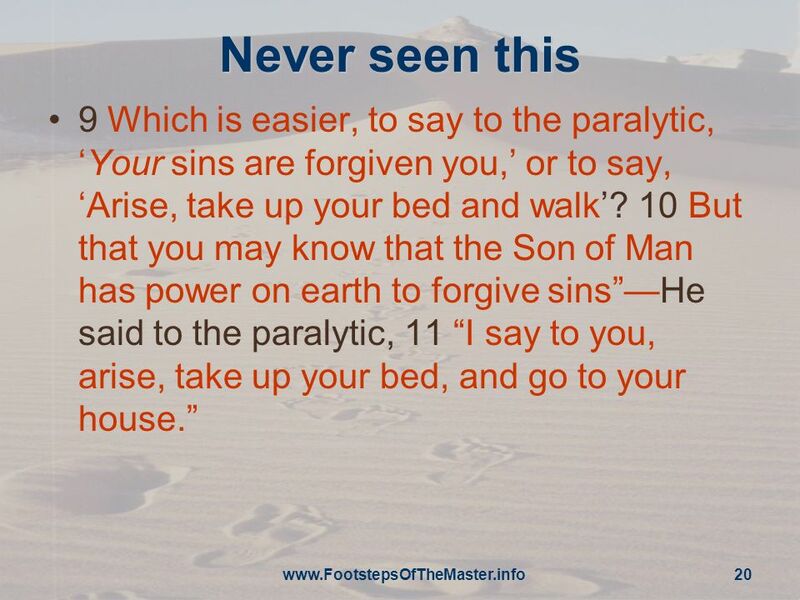 Which is easier, to say, “‘Your sins are forgiven you,’” or to say, “‘Rise and walk’”? 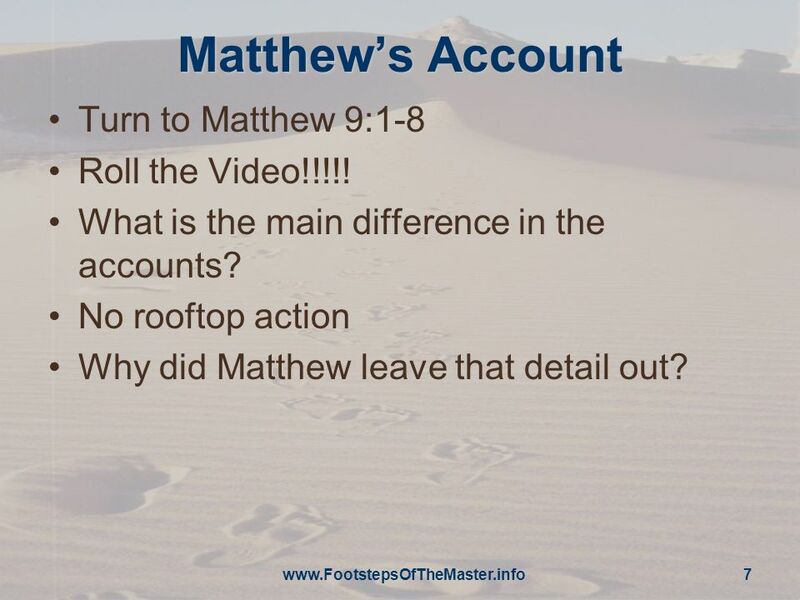 7 Matthew’s Account Turn to Matthew 9:1-8 Roll the Video!!!!! What is the main difference in the accounts? No rooftop action Why did Matthew leave that detail out? 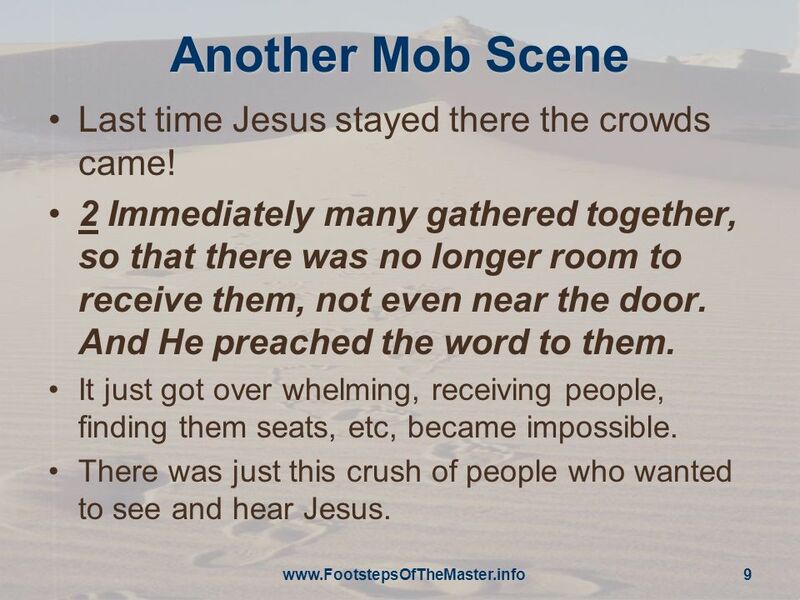 9 Another Mob Scene Last time Jesus stayed there the crowds came! 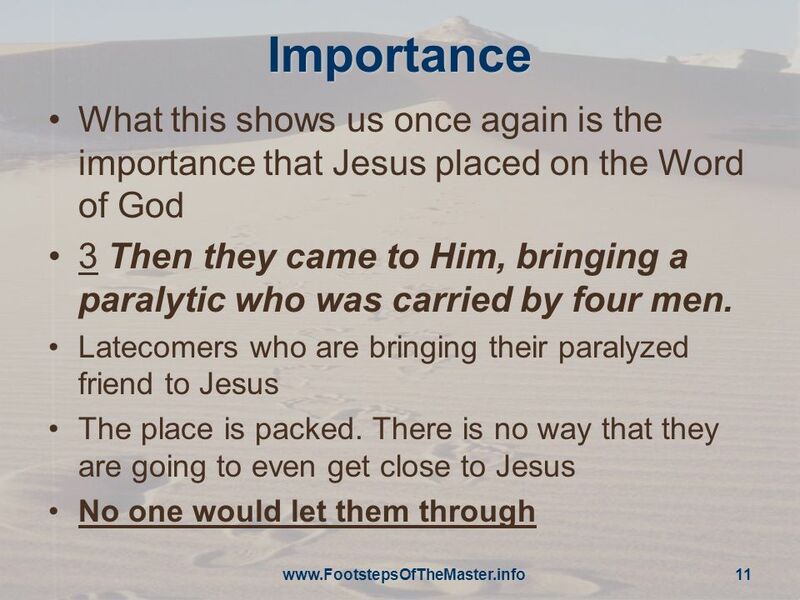 2 Immediately many gathered together, so that there was no longer room to receive them, not even near the door. 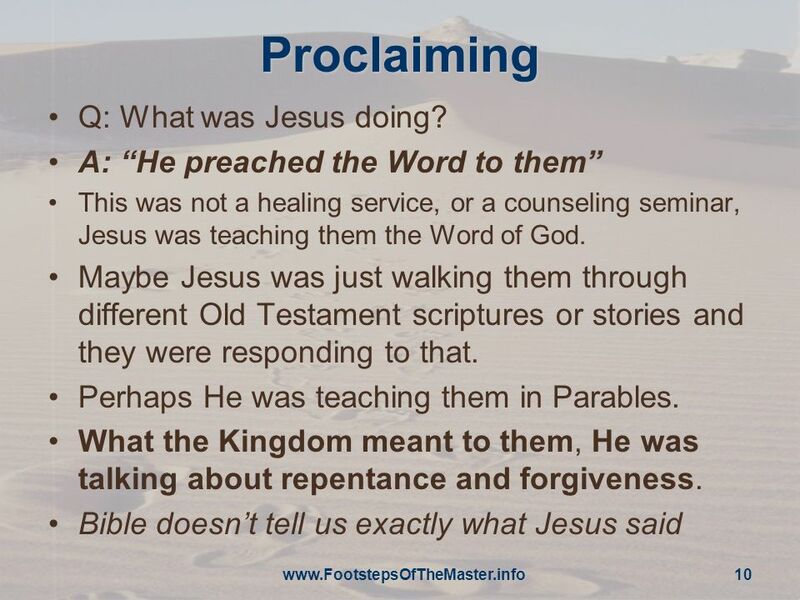 And He preached the word to them. It just got over whelming, receiving people, finding them seats, etc, became impossible. There was just this crush of people who wanted to see and hear Jesus. 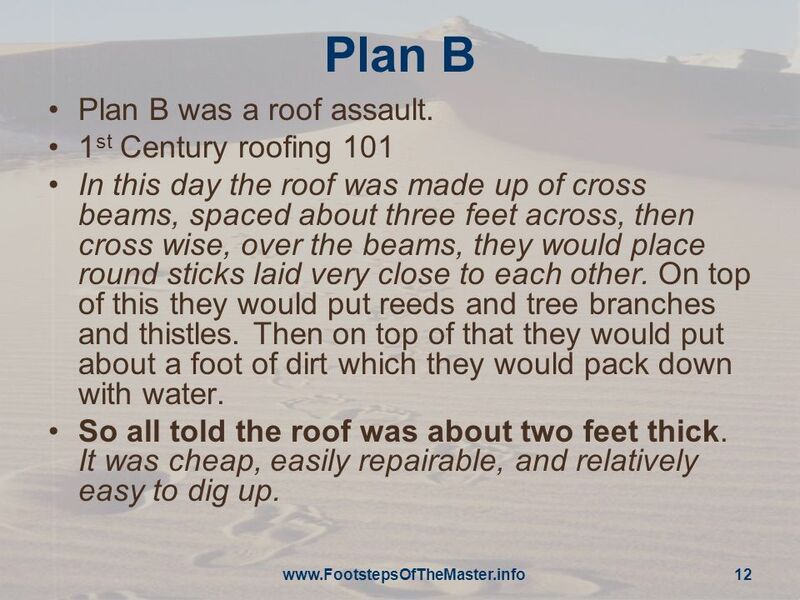 In this day the roof was made up of cross beams, spaced about three feet across, then cross wise, over the beams, they would place round sticks laid very close to each other. On top of this they would put reeds and tree branches and thistles. 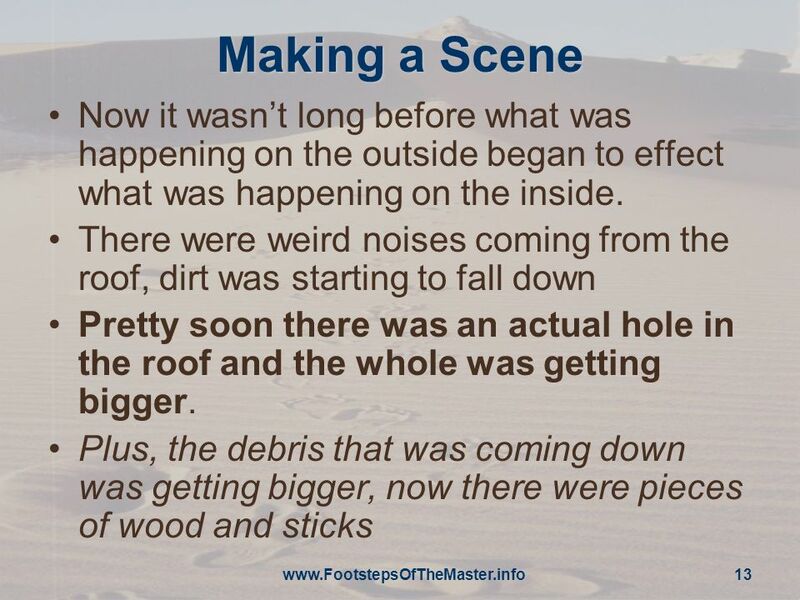 Then on top of that they would put about a foot of dirt which they would pack down with water. So all told the roof was about two feet thick. It was cheap, easily repairable, and relatively easy to dig up. 14 Mission Accomplished But finally, there he is laid out in front of Jesus. 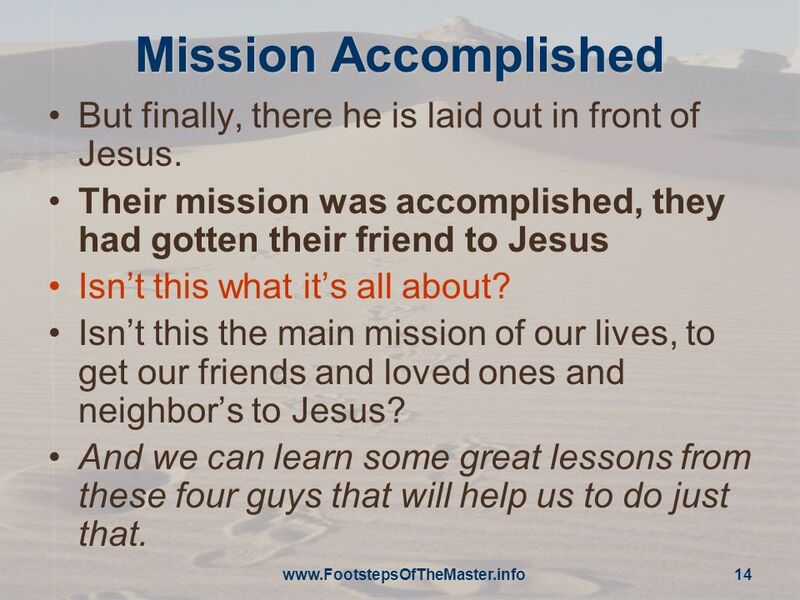 Their mission was accomplished, they had gotten their friend to Jesus Isn’t this what it’s all about? 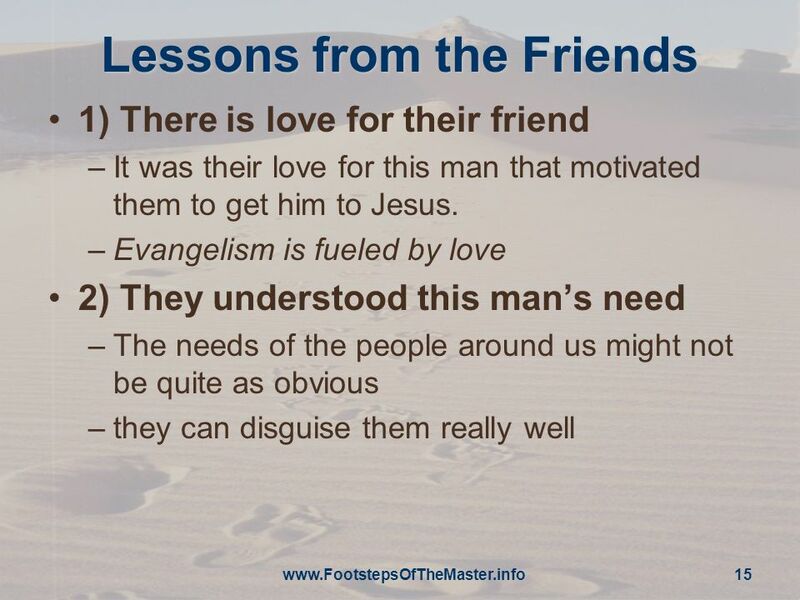 Isn’t this the main mission of our lives, to get our friends and loved ones and neighbor’s to Jesus? And we can learn some great lessons from these four guys that will help us to do just that. 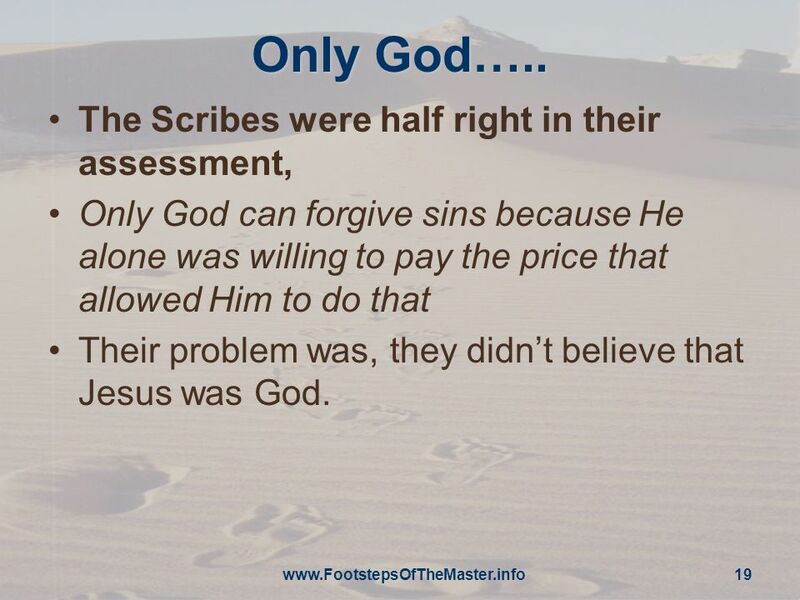 Only God can forgive sins because He alone was willing to pay the price that allowed Him to do that Their problem was, they didn’t believe that Jesus was God. 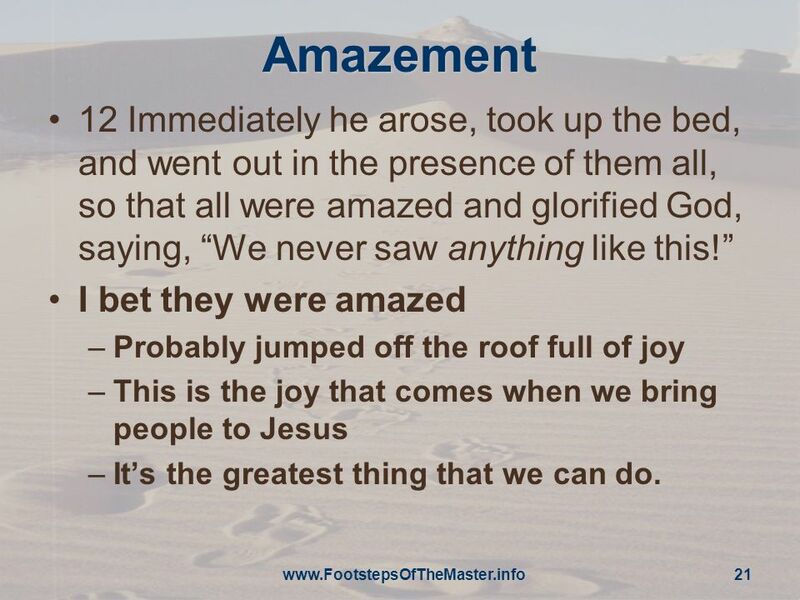 21 Amazement 12 Immediately he arose, took up the bed, and went out in the presence of them all, so that all were amazed and glorified God, saying, “We never saw anything like this!” I bet they were amazed Probably jumped off the roof full of joy This is the joy that comes when we bring people to Jesus It’s the greatest thing that we can do. 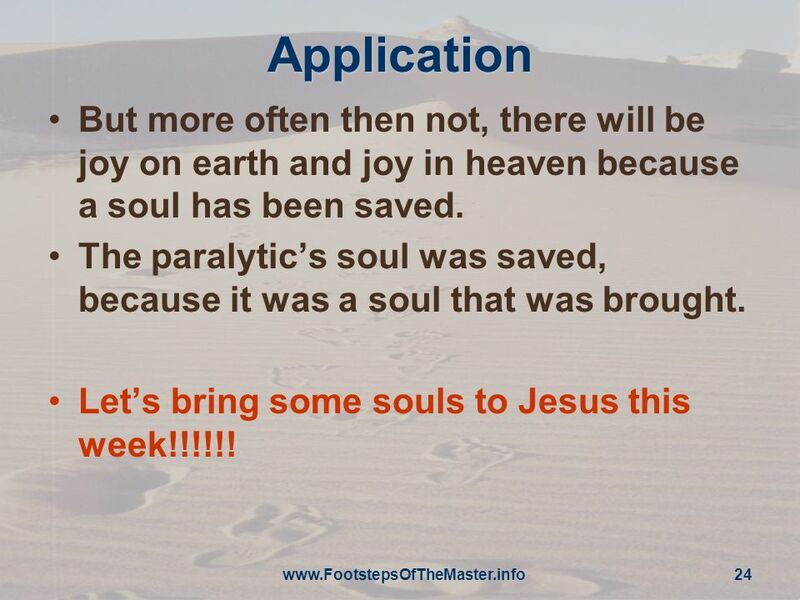 24 Application But more often then not, there will be joy on earth and joy in heaven because a soul has been saved. 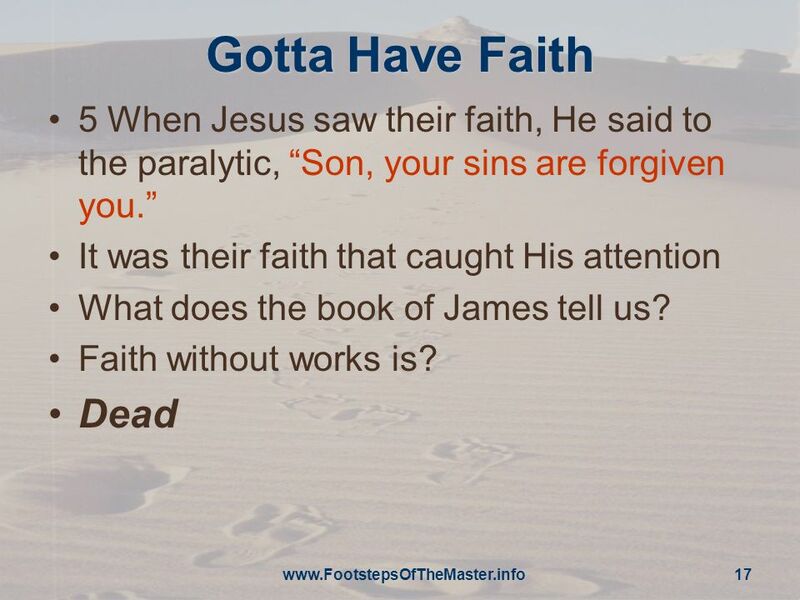 The paralytic’s soul was saved, because it was a soul that was brought. Let’s bring some souls to Jesus this week!!!!!! 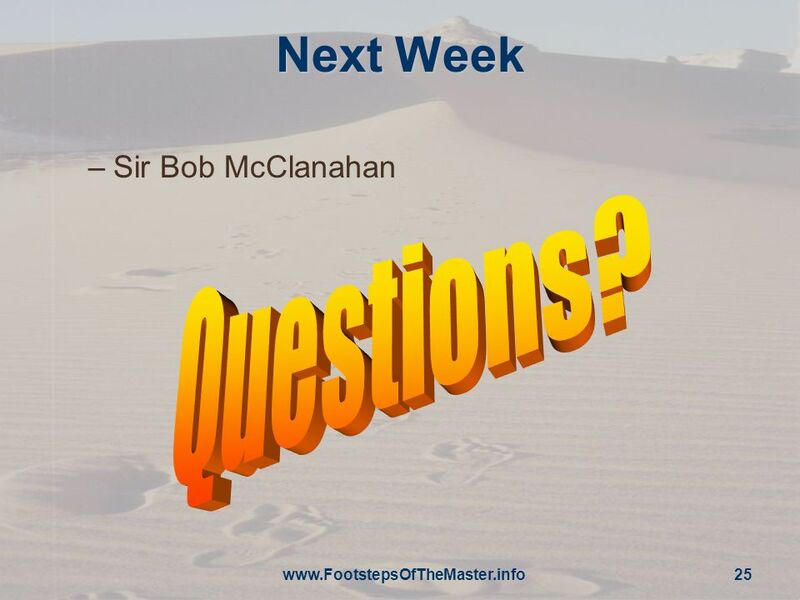 25 Next Week Sir Bob McClanahan Questions? 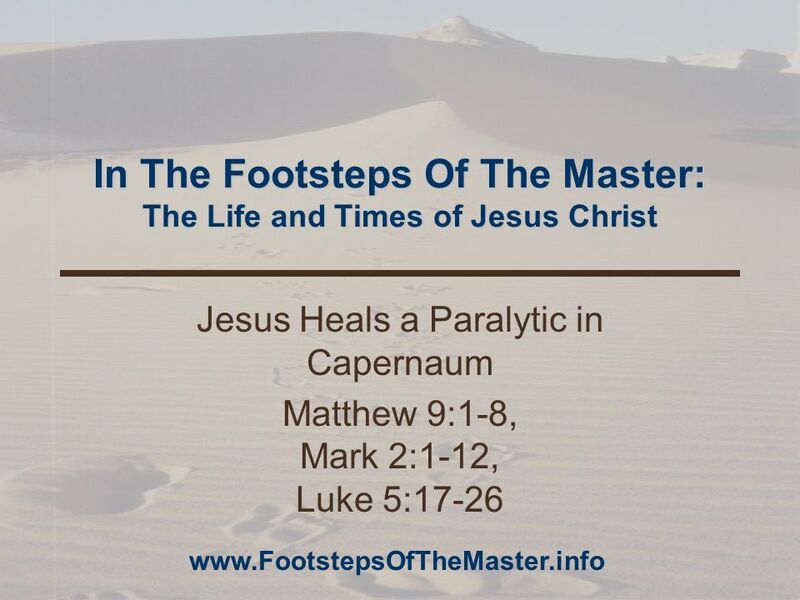 Download ppt "In The Footsteps Of The Master: The Life and Times of Jesus Christ"
Concert of Prayer PrayerforHealing PrayerforHealing. 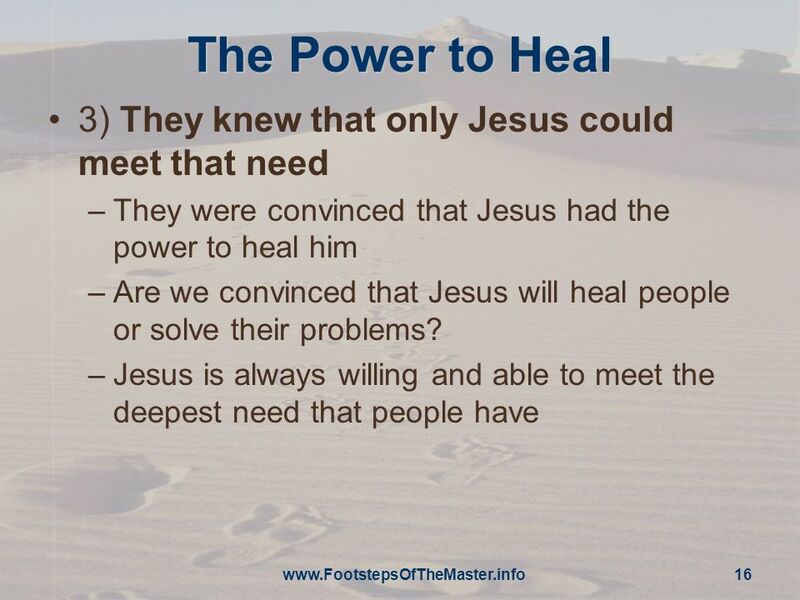 The God Who Heals 2 Kings 5: 1- 14; Luke 5:17 -26; John 9:1-41. Why be Bothered with Jesus Christ? Just maybe He is Who He said He was? ICEL How do we respond to the Word of God? 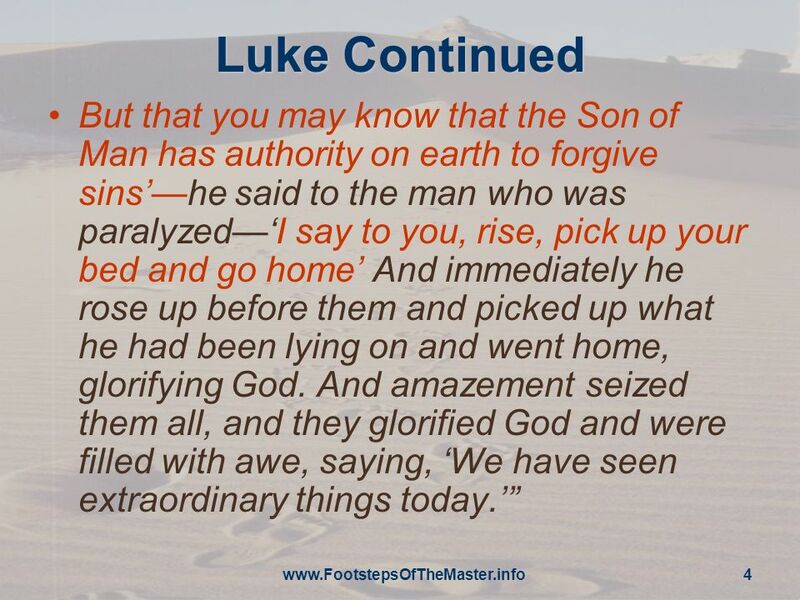 Luke 8:5-8 Luke 5:17-26. 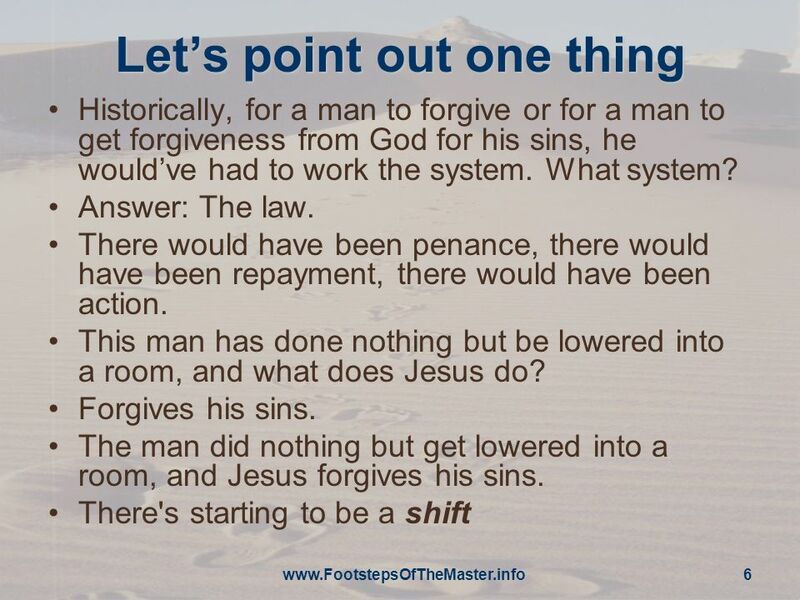 Forgiveness Offered October 9. Think About It … What are some causes of physical paralysis? How else might people be paralyzed other than physically? Mark 2:1-12 Jesus: Healer & Forgiver 1 A few days later, when Jesus again entered Capernaum, the people heard that he had come home. A few days later, when Jesus again entered Capernaum, the people heard that he had come home. MARK.2:1-12. Help Our Unbelief. Mark 9 (NAS) 23 And Jesus said to him, “ ‘If You can?’ All things are possible to him who believes.” 24 -Immediately the boy’s father. Announcement We will have our class on Jan. 18 at the Soc- Science Conference Room 3 and 4. And again he entered into Capernaum after some days; and it was noised that he was in the house. And straightway many. "MY MIND'S MADE UP!" REFUSING TO QUIT!. Romans 8:38 For I am convinced that neither death nor life, neither angels nor demons, neither the present nor. Gospels: Part 1. What about the Truth of the Gospels?  Background of the 4 Gospels 1.Mark 2.Mathew 3.John 4.Luke Q1 Why are there differences? Q1 Why. 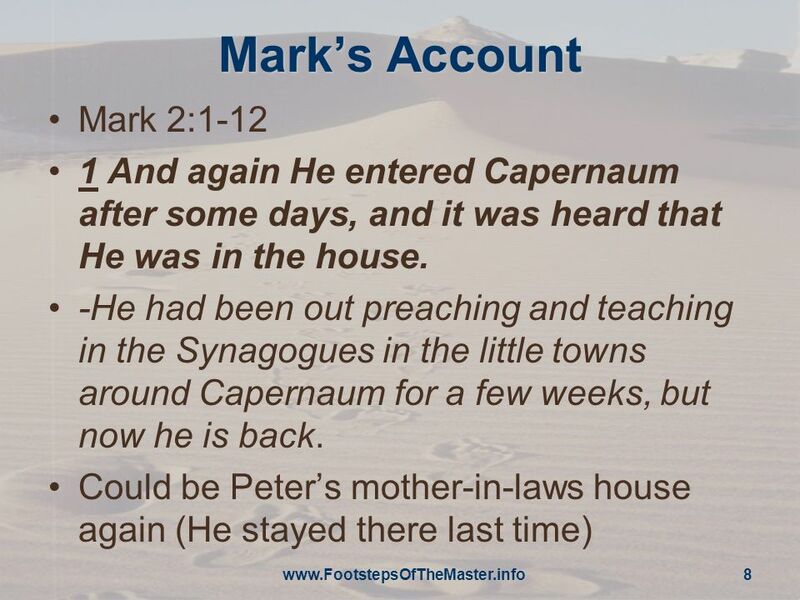 The Greatest Miracle Mark 2:1-12 Capernaum Nazareth. 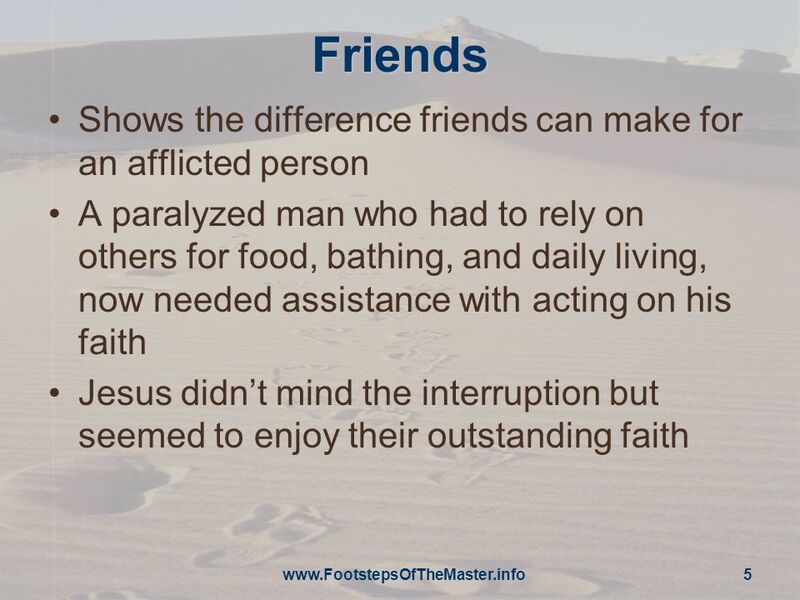 “Friend Day” Luke 5:17-26 cev & Selected Cross Creek Community Church, Pastor Dave Martin – June 14, 2015. BISHOP DAVID COSGROVE. THERE IS ALWAYS A RETURN OF GOD THAT WILL CAUSE YOU TO BE HAPPY, JUST AS GOD IS HAPPY WITH OUR OFFERINGS. 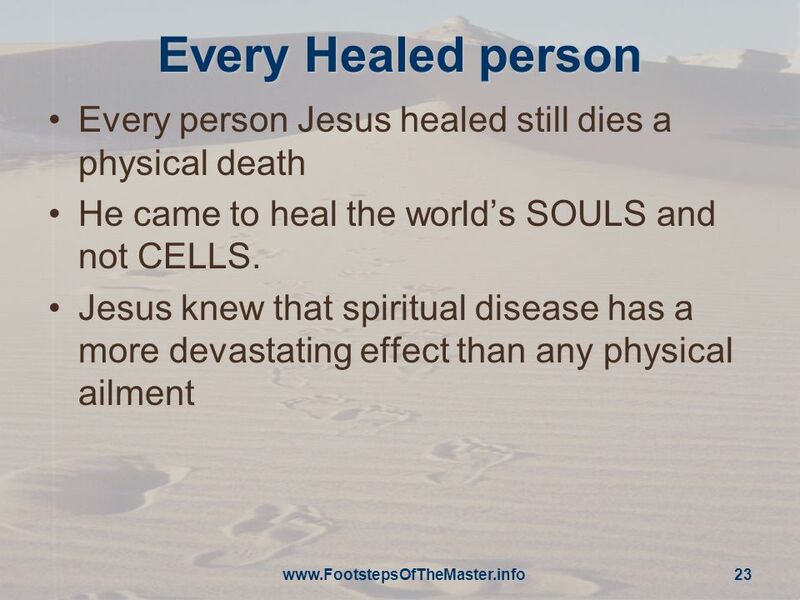 Luke 5: And it happened when He was in a certain city, that behold, a man who was full of leprosy saw Jesus; and he fell on his face and implored. Committed to passionately... Live like Jesus lived, Do what Jesus did, and Advance His kingdom together. Welcome to The Church on the Rock. Notices 1.Revival Prayer Meeting (Qld Baptists’ Focus on Prayer Week) – Wednesday 4 June 6-9pm at Harlaxton Neighbourhood.